George Henry Harlow was born on 10 June 1787 in St James's Street, London, the youngest child and only son of a merchant of Canton, China, who died in February 1787, four months before he was born. Harlow was brought up by his mother, Elizabeth (1759/60–1809), who was widowed at the age of twenty-seven; of his five sisters only one survived to adulthood. From a young age he attended Dr Barrow's classical school in Soho Square, London; then he was sent to a Mr Roy in Burlington Street before his interest in drawing led to his being placed with the landscape draughtsman Henry de Cort. Next he became the pupil of the painter Samuel Drummond and, having rejected the offer made by friends of his father of a writership in India, when about fifteen entered the studio of the celebrated portrait painter Thomas Lawrence. A memorandum of an agreement dated 9 December 1803 made between Lawrence and Elizabeth Harlow records that from that day for one year Harlow would ‘faithfully serve and assist’ Lawrence ‘in his art or profession of a portrait painter’, and that in return Lawrence would ‘to the best of his abilities teach and instruct … Harlowe in the Art or profession of a portrait painter’ and ‘at his own expence find and provide … Harlowe with all such Canvas colours paints brushes and other ingredients’ (Lawrence papers, RA, Law 1/105). On the same day Joseph Farington noted in his diary that ‘Lawrence has got a young pupil of 15 years of age, who draws, Lane says, better than He does. His name is Harlow’ (Farington, Diary, 5.1943). His foibles led his friends to give him the nickname Clarissa Harlowe (many later references to Harlow include the final ‘e’ to his surname). Following a breach with Lawrence about a painting, Harlow stayed at the Queen's Head, Epsom, where, to discharge his bill, he painted a signboard in a style caricaturing that of his master which he signed ‘T. L., Greek Street, Soho’ (ibid., 279). After this rupture Harlow did not seek further instruction but went on to paint ‘at a low price many of the actors of the day, and thus fell into their society, and being of an easy, careless disposition, soon became embarrassed in his affairs’ (Redgrave, Artists, 198). Financially dependent, as most artists then were, on portrait commissions, and seeking further patronage through the exhibition of his work at the Royal Academy, Harlow evidently sought also to redeem his early loss of position as Lawrence's pupil by seeking the notice of other academicians and thus to gain a stronger foothold within the academy. His series of artists' portraits was done ‘con amore and gratis’ (Literary Gazette, 202). In 1816, however, his candidacy for associate status within the academy received only one vote (from Fuseli, who commented, ‘I voted for the talent—not for the man!’ (Cunningham, 5.281)). Of Harlow's portrait drawings that of Haydon reproduced as the frontispiece to The Autobiography and Memoirs of Benjamin Robert Haydon (1926) is similar in format to several others, including a fine one of William Godwin, signed and dated 1816 (priv. coll. ), and the elegant and highly finished chalk drawing of Lord Byron (c.1815; priv. coll.) engraved by Henry Meyer for the New Monthly Magazine (July 1815). The fashionable fencing master Henry Angelo recollected that ‘Harlow … whom I had known from a boy, made two drawings (through my recommendation), one of his lordship, another of his sister’ (Angelo, 131). While staying with Charles Madryll Cheere at Papworth Hall, Cambridgshire, Harlow wrote on 8 August 1815 to Henry Colburn, publisher of the Monthly Magazine, stating, ‘We are all great admirers of Lord Byron here and it would be very gratifying to give away a print or two of him to my friends’ (Michael Silverman sale catalogue). Harlow's obituarist recorded that ‘Mr Harlow was in the habit of drawing, and depositing in a book, the likenesses of eminent persons with whom he was struck on meeting them in company. These are among the most precious of his remains.’ (Literary Gazette, 202) Of those mentioned many are signed with Harlow's initials G. H. H. or sometimes G. H. Harlow and dated with the day, month, and year. Other sitters included the Gothic novelist M. G. (Monk) Lewis (engraving by J. Hollis, repr. in Finden's illustrations to … Byron, 1834); Horace and James Smith, authors of Rejected Addresses (1812); and the actors Elizabeth Inchbald (1814), Robert Elliston (1814), John Kemble, and Charles Mathews (first two, Garrick Club, London). Others are listed in the catalogue of the posthumous sale of ‘a few capital original pictures, studies and drawings, the works of G. H. Harlow’ held ‘by Mr Christie’ on 3 June 1820 (Catalogue). Of Harlow's other known portraits in oil, those of actors form a distinctive group. These include Robert Elliston (c.1808), John Philip Kemble as Coriolanus (c.1808), A Group of Portraits of Mr Mathews in Private, and in Various Characters (exh. RA, 1814; engraved Henry Meyer 1817, and W. Greatbach for Mathew's Memoirs, 1838), Sarah Siddons as Lady Macbeth (c.1813), another Sarah Siddons as Lady Macbeth (c.1814), and Catherine Stephens as Diana Vernon (c.1818; all Garrick Club, London, all repr. in Ashton). All these portraits were formerly in the collection of the actor Charles Mathews, who was a close friend of Harlow's. A small bust-length portrait in a painted oval of Catherine Stephens, afterwards countess of Essex (engraved by W. Say, 1816), is at Petworth. For portraits such as the small whole length of Sarah Siddons as Lady Macbeth, Harlow charged 20 guineas. In April 1817 Farington noted that ‘Sir G. & Lady Beaumont were strongly impressed with the excellence of a picture by Harlowe, representing the Kemble family in characters forming a Scene in the Play of Henry 8th’ (Farington, Diary, 14.4998), but that ‘it was certainly a work which approached towards vicious art, finery & ostentatious display’ (ibid., 5008). Intended for display on the densely hung walls of the academy's great room where exhibited works competed for the attention of a large crowd of viewers, this work, with the melodramatic expressions and gestures of its characters, heightened by rich colouring and a composition that conveys an impression of deep three-dimensional space, was nevertheless highly successful as a theatrical genre painting. Fuseli advised Harlow on compositional details, including the placing of the two page boys in the foreground ‘to throw the eye of the spectator into the picture’ (Cunningham, 5.285). Harlow included in the painting a self-portrait; he is standing immediately to the left of the cross behind the cardinal. The copyright to a plate for engraving the painting was sold for 500 guineas, and the mezzotint by George Clint further enhanced its popularity. Farington replied, ‘He appears to have been sadly and strangely neglected during his illness, and, if better attended and with proper medical advice, might probably have recovered’ (Farington to Lawrence, 6 April 1819, RA, Law 3/26). An ‘Exhibition of paintings and drawings of the late Mr George Henry Harlow’ held at 87 Pall Mall, London, in 1819, which included his sketches and sketchbooks, helped to discharge Harlow's debts to creditors of whom Welsh was the principal. Two sales held at Fosters on 21 June 1819 and Christies on 3 June 1820 comprised paintings and drawings by Harlow, including his Italian studies, the original sketch for Wolsey, and casts from antique sculpture which he acquired in Italy. 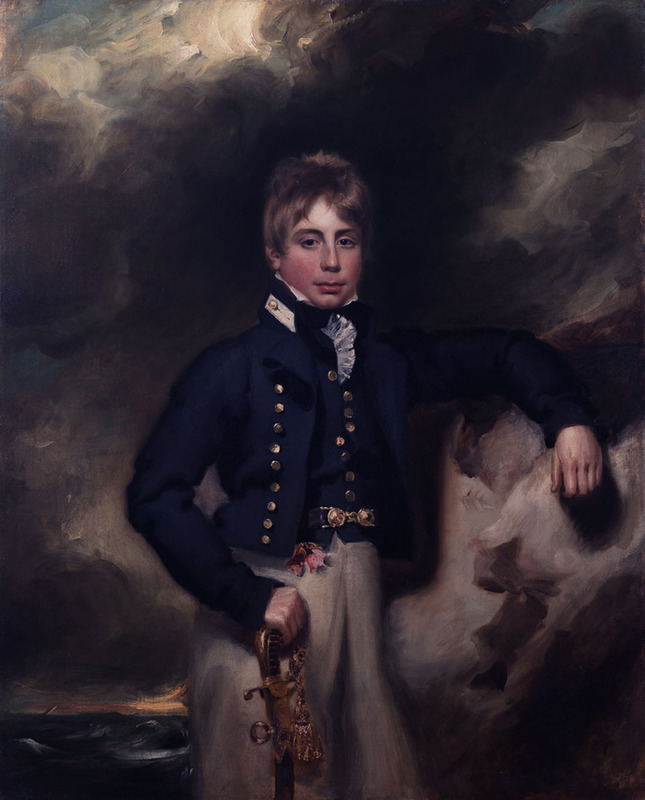 Less than a year before this portrait was painted and exhibited at the Royal Academy, the sitter who gazes confidently out of it had been present at the Royal Navy’s most important fleet action of the 19th century and one of the last great naval battles of the wars against France 1793-1815: the Battle of Trafalgar, 21st October 1805. In the remaining years of those wars and in the decades of peace that followed, the sitter was to have a varied career – participating in Boat Actions with one of the great frigate captains of the age, serving on a series of flagships, chasing smugglers in the North Sea and protecting British trade and political interests in the eastern Mediterranean – but, when this portrait was painted, all that lay ahead of the adolescent midshipman of robust appearance portrayed here. After some manoeuvring in inconsistent wind and weather conditions, the two fleets finally sighted each other early in the morning of 21st October 1805 off Cape Trafalgar, the combined French and Spanish fleets some eleven miles north-east of the British fleet, formed in a loose line of battle and thought to be heading back to Cadiz; Nelson ordered his fleet to intercept them and cut off their line of retreat to Cadiz. The British fleet divided itself, as pre-arranged, into two divisions – the weather and the lee divisions – each headed respectively by Nelson in HMS VICTORY and by Collingwood in HMS ROYAL SOVEREIGN. HMS DEFENCE fell into her prescribed place in line towards the rear of the lee division and so her ship’s company were of necessity forced to watch the battle become joined for some time before their ship was able actively to participate. The two British divisions pierced the enemy line, with the consequence that the British ships had to receive fire for some time before being able to return it and also, once through the line, often found that they were required to fight several ships at once. Nothing is known that records where on DEFENCE Midshipman Dalling was stationed at the battle of Trafalgar and he appears not to have left any surviving account of the battle; it is most probable that he was in charge of a sub-division of the ship’s guns, under the overall command of a lieutenant, on either the lower deck or gun-deck since many captains stationed most of their midshipmen in those locations in battle – where they were less vulnerable to enemy fire than on the exposed quarterdeck, forecastle or poop. We are fortunate, therefore, in having brief personal accounts of HMS DEFENCE’s part in the battle left by two other of the ship’s midshipmen, Charles Reid and Thomas Huskisson. It seems that, despite her orders, AMPHION was still in Malta when Midshipman Dalling was discharged from her, with effect from 16th April 1807, to join HMS ROYAL GEORGE and so end his first period of service under Captain William Hoste, since, in a note signed by Hoste on 16th April, Dalling’s captain noted that the ship is still in port on that island. The note would have been intended for Dalling to keep and to show, among his logs and other papers, to the board of captains that would eventually examine him for his fitness to be commissioned lieutenant: it reads as follows.